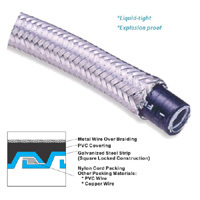 Made from a premium-grade conduit construction, with metallic over-braiding for explosion proof, increased abrasion resistance, mechanical strength and EMI shielding. EXplosion Proof Flexible Conduit is extensively used in machine tools, automobiles, ships and trains. It is also suitable for applications within hazardous atmospheres where specifications require total containment of power and/or network or communication cable.